Sport Fish Michigan is now booking trips for Walleye Season in Detroit. Sport Fish Michigan enjoyed some truly incredible walleye fishing on the Detroit River this past spring. We were very fortunate to be one of the top boats on the river, with limit catches for our customers almost every outing. 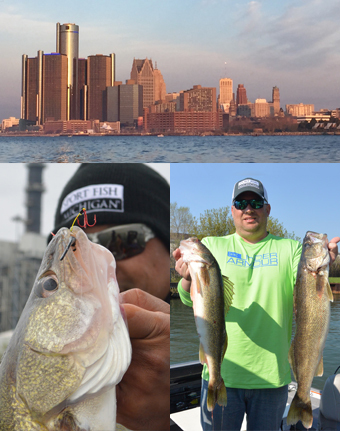 Sport Fish Michigan will once again be guiding for walleye on the Detroit River this coming spring. We will be offering our trips using our 2-Captain system again this year - it creates for a better overall experience with increased efficiency and personal attention for our customers. We will be offering 2 trips per day every day that we are in town, and will be guiding 7 days a week. While we have some trips booked already, we would like to invite those that are interested to book your guide dates early to secure the best times. Sport Fish Michigan will be guiding for walleyes on the Detroit River from April 18th through May 6th. This should be the optimal time for not only getting into some big walleyes, but also getting into some nice numbers. Not only was there better fishing on the Canadian side the past two years, but the bigger fish seemed to be there, as well. It was great to be able to take advantage of this the past two years, but our 2017 guide trips will usher in some new requirements for fishing in Canadian waters: the government is adding border security enhancements that we will have to follow. It will now be 100% mandatory to have a current passport on your person when fishing in Canadian waters, and if a passport is not available for each person aboard, we will be limited to fishing on the US side only. 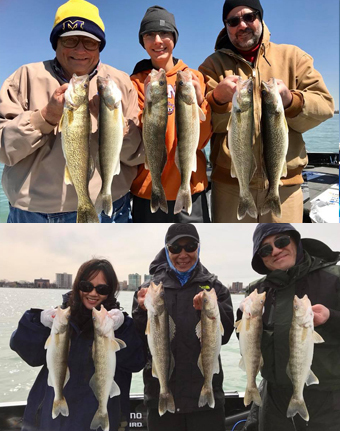 Sport Fish Michigan plans on having 3 Captains working on the Detroit River this coming spring, and our intention is to have 2 Captains out on every trip. This helps to facilitate a much smoother experience for our customers than what other guide services offer. Not only can we attend to the needs of our customers better with 2 Captains aboard, we can keep the boat in the zone consistently as the second Captain helps to control the boat. Having fished the river for years, we feel that our experience and dual Captain system will make us one of the top boats on the river next year, just like we were this spring. We have partnered with a local hotel in a nice, secure location just minutes from the ramps that we use. Discounts are available from this clean and safe hotel. We look forward to fishing with you on the Detroit River this coming April. Spaces are limited for each season, and we have lots of customers expressing an interest in joining us. Don't hesitate too long, or our limited seasons will be filled!